Campania is where my wife’s mother and family is from. She (Anna) was born on the beautiful Isle of Capri in 1911. When Anna was a child, her family came to America and opened a business in Hoboken, New Jersey. What I learned from Anna was how proud and loyal she was to Campania, its people and land. The rolling hills along the Amalfi Coast to Naples and Avellino is dotted with walled villages, ancient ruins and towering churches. Campania is a land full of vineyards, pizza made famous in Naples, special lemons for the production of limoncello and prize buffalo milk for mozzarella di bufala. Gastronomically, with the sea nearby and spaghetti alla vongole on every table, it's hard not to love the epicurean delights of Campania. San Marzano tomatoes thrive in the volcanic soil that is the base for many vineyards in Campania. Winemaking began in the 7th century B.C. On a recent trip to Campania, I had the opportunity to spend time with the Basso family, a family proud of their heritage. Campania means as much to them as to my mother-in-law. Choosing to show our small group Pompeii and Pasteum was of equal value as showing us their winery and olive oil factory. Villa Raiano, near Avellino, an hour or so from Naples, is home and namesake of the vineyard. ” Irpinia is our land” was the title of the booklet that one of the new faces of Villa Raiano, Brunella Basso handed out upon arrival to the vineyard. Her brother, Federico Basso is the other new face at Villa Raiano. Between the two of them they will run and market their wines worldwide. Fabrizio Basso, a cousin, is an integral part of the other family jewel, Basso olive oil. During his free time, he hangs out at the vineyard. Villa Raiano produces 300,000 bottles a year, with a capacity to add another 150,000 bottles when the time comes. 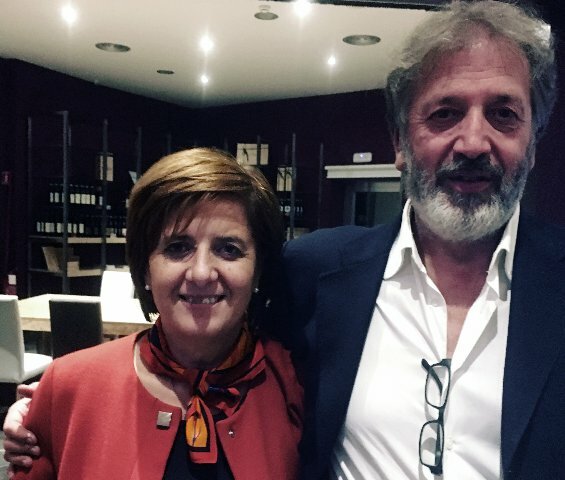 Fortunato Sebastiano is their consultant winemaker and Gabrizia Cellai is responsible for overseas sales, along with marketing guru, Brunella Basso. The staff at Villa Raiano is tight knit. No egos, just positive energy. And the positive energy carries over to their wines. The indigenous varieties of Campania carry over to high quality wines, whose characteristic is the terroir of Irpinia. Tradition is what Villa Raiano is about. The estate at Villa Raiano was established in 1996 by Simone and Sabino Basso and brother-in-law Paolo Sibillo. The property has over 40 acres, planted around the hills of the ‘Irpinia’ area in Avellino. Classic wines from the region are produced: Fiano di Avellino, Greco di Tufo, Falaghina, Aglianico and Taurasi. Their wines plus small batch Grappa and Sparkling will be featured in an upcoming article. If you are in the Naples area, take a train to Avellino to visit the winery. .
Visit www.VillaRaiano.com to learn more about this wonderful Irpinia winery.